In Chinese cuisine, dates are a valuable nourishing ingredient. 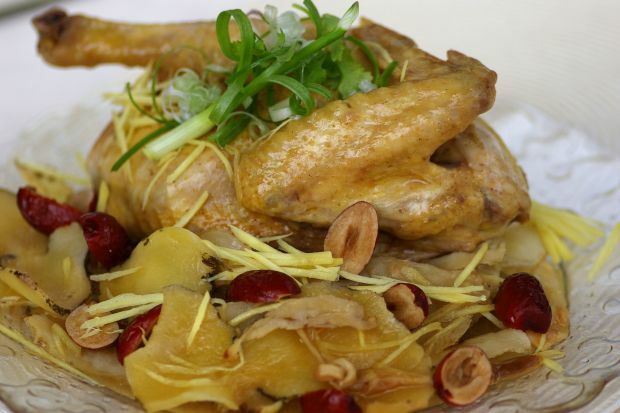 So, here is the recipe for steamed herbal chicken with red dates and ginger. Bring a pot of water to boil and scald the chicken for 3–4 minutes. Remove and allow to cool slightly. Rub a tablespoon of the sauce evenly all over the chicken. Mix the remaining sauce with the the rest of the ingredients, except the wine. Arrange the chicken and the rest of the ingredients on a heatproof dish and steam over rapidly boiling water for 30 minutes, drizzling the rice wine over at the last 5 minutes of steaming. To check if the chicken is cooked, use a fork to poke through the thickest part of the chicken – if the liquid that ooze out is clear, it’s done.